Zika, Mandatory Vaccinations, REAL ID to fly….all coming down this Fall/Winter 2016/17. 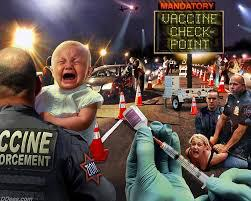 Soon you will not fly, go to a bank or even a sporting event unless your REALID says you’ve obeyed those that have control over your life, unless you get shot up with harmful vaccines. NO opt outs. No choice. Just take it! The U.S. Centers for Disease Control and Prevention literally has overstepped its authority in proposing to grant itself powers that obviously negate any rights U.S. citizens thought they had by issuing the Proposed Rule “Control of Communicable Diseases” on August 15, 2016 wherein CDC will self-invest itself with the power to apprehend healthy people en masse and detain them indefinitely with NO process of appeal! This proposed CDC rule, in my opinion, is an “end run” or a “Hail Mary pass” around what’s become a nightmare situation in the USA regarding Big Pharma’s ‘sacred cows’—vaccines and vaccinations—which many more healthcare consumers are waking up to being what they actually are: neurotoxic injections damaging children, adults and pets!